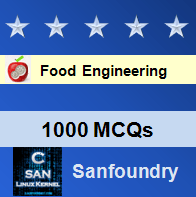 This set of Food Engineering Multiple Choice Questions & Answers (MCQs) focuses on “Unit Operations – Crystallization-1”. 1. Celinium Sulphate is an exception of the solubility curve. When the temperature is increased, its solubility decreases. Explanation: Celinium Sulphate is an exception of the solubility curve. When the temperature is increased, its solubility decreases. 2. Which of the following is NOT an important criteria for crystal formation? Explanation: All the mentioned factors are important criteria for the formation of crystals. 3. Statement 1: The solubility of NaCl increases with the increase in temperature. Statement 2: Crystal formation is hindered by nucleation taking place on the crystal surface. Explanation: The solubility of NaCl increases with the increase in temperature. Crystal formation is hindered by nucleation taking place on the crystal surface. It should take place from within. 4. Statement 1: Solid food items containing water molecules are more soluble as the temperature increases. Statement 2: This growth takes place in steps. Explanation: Solid food items containing water molecules are more soluble as the temperature increases. This growth takes place in steps. 5. Which of the following tells the significance of crystallization in food processing? Explanation: Consistency of food emulsions, a good feel of food inside the mouth and the physical stability of food, all have a significant effect on the food processing. 6. Statement 1: Crystallization is both a mass and heat transfer operation. Explanation: Crystallization is both a mass and heat transfer operation. The crystals and mother liquor obtained from a crystallizer are called magma. 7. Statement 1: Smaller particles dissolve as they have a larger surface area and larger particles grow. Statement 2: The above process is called Ostwald ripening. Explanation: Smaller particles dissolve as they have a larger surface area and larger particles grow. The above process is called Ostwald ripening. 8. The ratio of concentration of a super saturated solution to a saturated solution is denoted by α’ which is stated by the Kelvin equation. How is it related to the crystal size and interfacial tension between solid and liquid? Explanation: Crystal size is indirectly related to α’ and interfacial tension between solid and liquid is directly related to α’. Explanation: All of the mentioned factors affect crystallization. 10. Which of the following facilitates crystallization? Explanation: All of the mentioned ways are applicable for crystallization. 11. Statement 1: Batch crystallizers are used if the throughput is high. Statement 2: The operating cost of batch crystallizers is high. Explanation: Batch crystallizers are used if the throughput is low. The operating cost of batch crystallizers is high. 12. Statement 1: Batch crystallizers use the concept of cooling of hot solution/magma. Statement 2: Control of particle size is poor in a batch crystallizer. Explanation: Batch crystallizers use the concept of cooling of hot solution/magma. Control of particle size is poor in a batch crystallizer. 13. Statement 1: Batch crystallizers are used for jaggery. Statement 2: Particle size is controlled by stirring and scraping the concentrate from the vessel for better heat transfer. Explanation: Batch crystallizers are used for jaggery. Particle size is controlled by stirring and scraping the concentrate from the vessel for better heat transfer. 14. Scraped surface crystallizers can be used for viscous fluids up to 10000 cp. Explanation: Scraped surface crystallizers can be used for viscous fluids up to 10000 cp. 15. Which of the following is true about scraped surface crystallizers? Explanation: Scraped surface crystallizers are small in size and have a low installation cost. They can be used for a wide range of temperature differences. Expansion of capacity is easy as more units can be conveniently added.